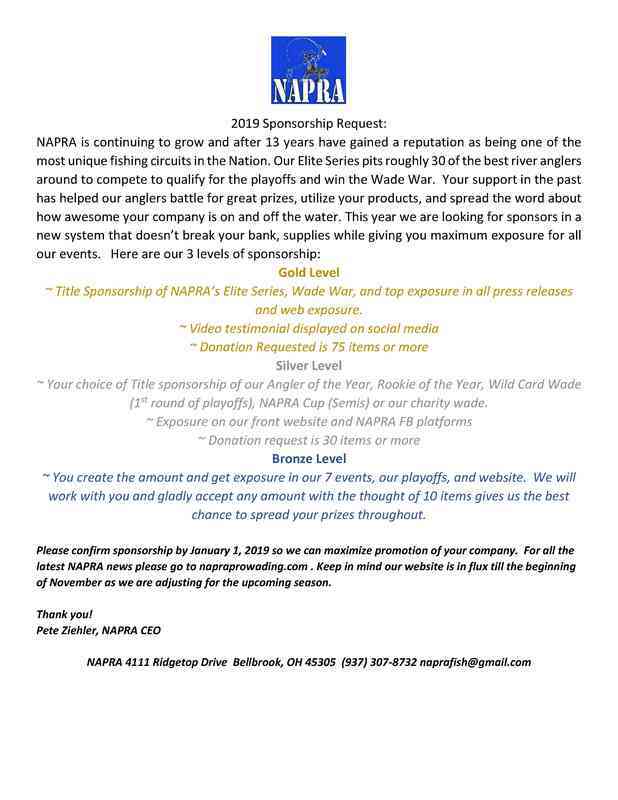 NAPRA has had many sponsors over the course of our run. We can't thank our sponsors enough for providing great prizes for our competitors, fans, and industry folks! The products have been tested and proven to be the best qualify and go to lures, gear, tactical gear, and provisions needed to compete in our circuit! 1) We give you exposure to our special niche of anglers. 2) We use the products, review them, and post praises that puts the proof in the pudding that your products work! 3) We will work with you at any level of sponsorship and prefer to work with "Ma and Pa" companies and not big fishing conglomerates. Why? We can talk directly to the craftsmen and women whom make the products and so can our members. Big companies like KingStrike and PalaRap (Get our drift?) care about profit over quality. Yes, their stuff works but do they care that an angler in Ohio caught a personal best fish? Nope, not unless their name has MLF or BASS included.